mintcards4u has no other items for sale. 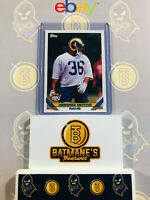 JEROME BETTIS 1993 Classic 4 Sport Rookie Card PGI 10! JEROME"BUS"BETTIS HUGE FOOTBALL CARD LOT!!!! PITTSBURGH STEELERS!! !